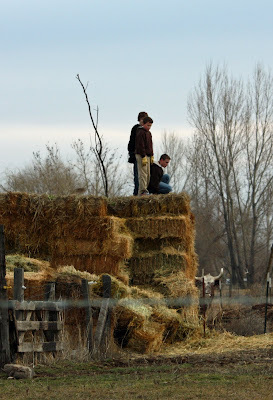 I was thinking these kids were having fun climbing on the haystacks, kinda like when I was a kid, we liked to scramble up the stacks of sugar beets (really!). But after taking a closer look at the photo, I'm not so sure these kids weren't on the hay to keep their distance from that longhorn in the right hand corner? It's interesting to enlarge and study their expressions. They don't appear to be looking at the longhorn and I think the child who is mostly obscured is smiling. Does make you curious, doesn't it? I think there could very well be a fence between Mr. Longhorn and those kids. Looks like they might even be dressed for "work" judging from the kind of gloves being worn.